The Café Life Award is a celebration of all that's great about café fayre. The Café Sandwich Challenge and the Tetley Afternoon Tea Experience Challenges bring the finest, most creative people in the sector together pairing new and unique creations with beverages to offer a truly great cafe experience. Head judge of the live final held at lunch! the contemporary food to go show was celebrity chef and café entrepreneur, Aldo Zilli. 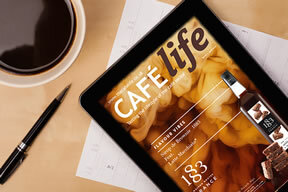 Speaking at the Café Life Awards said: "innovation in the sector is awesome. When I had my café in Soho about 15 years ago we tried things that were ahead of its time. Since then things have leapt forward in the café section and they're now closing in on the restaurant sector. The progress in the last year alone is immense and the artisan approach of cafes, using amazing produce is bringing us amazing food and beverages."